Omics has enjoyed a great deal of success in research. Nevertheless, the use of omics data in regulatory assessment has been hindered, in particular, by the different approaches to the processing of the data can lead to different outcomes even from the same data set. Development and acceptance of common foundation methods on data analysis and reporting will assist in the acceptance of omics analysis as a fundamental tool for use in regulatory toxicology. This can be achieved by setting the guidelines for the foundation methods for data analysis that would allow an easy comparison between datasets, but not preclude the use of further analytical methods considered appropriate by the analyst. A survey conducted by ECETOC found that to date, omics data has never been used to support a submission under REACH, though there has been use in supporting pesticide submissions in the USA. A problem is the lack of agreed consistent methods that can be applied to the analysis of ‘omics data. In a research environment analysis methods are justified in publications in the scientific literature that have been independently reviewed. The regulatory environment however requires a more prescriptive approach where studies must be consistent, reproducible and comparable in order reach consistent decision making. To start debate within the regulatory science community, an ECETOC expert team developed a ‘strawman’ framework for transcriptomics and other big data analysis for regulatory application. This debate has taken place through several meetings with ECHA, the OECD (EAGMST) and most recently a multi-stakeholder ECETOC workshop on Applying ‘Omics Technologies in Chemicals Risk Assessment (Madrid, 10-12 October, 2016). Predicting toxicity is possible using data generated at a molecular level, in that adverse effects at an organismal level are underlain by changes at a molecular/ cellular level. There is however acceptance of the limitations of using single-stream molecular data (e.g. mRNA levels) to identify specific hazards or group chemicals in read across. The purpose of this study is to develop a network approach by combining data streams from several “omic measurements for example transcriptomics, epigenetics and metabolomics and apical/pathological endpoints to map evolution of molecular changes with pathological/toxicological change. Using substances with well characterised adverse outcome pathways the study will map the evolution and connectivity of multi-omic measurements across time and dose. It is anticipated the study will address questions about adaptive versus adverse molecular changes and the persistence of change over time with linkage to disease outcome. Using already available data bases explore how multi-omic measurements can and have been be fused to generate a map of the molecular landscape linked to apical endpoints for selected and well characterised adverse outcome pathways. Based on the analysis of existing information generate a new data set of multi-omic measurements (e.g. transcriptomics (mRNA), epigenomics (miRNA), proteomics and metabolomics), using one or more reference compounds. Reasons for including a particular ‘omic measurement should be justified. The researchers will collect and analyse data collected over various time points to explore differences between acute and persistent changes in gene expression and which molecular changes persist over time. The integration of multi-omics will bring understanding of the molecular landscape linked to pathological change and if multi-omic measurements provide complimentary information to understand and predict adverse effects. For example, which ‘omic measurements provide optimum biomarkers of adaptation and which provide optimum biomarkers of persistent change linked to pathology. It is anticipated this project will require collaboration of scientists with expertise in toxicology/pathology and scientists with expertise in the differing molecular measuring platforms. The assay, analysis, data management and data dissemination aspects of such a large study is feasible but the researchers will provide details of how the project will be integrated and managed. -Integration of omics data to compare changes in molecular signatures across time for the purpose of identifying the signal associated with a primary mode of action from the signal that is elicited by the pathology itself. 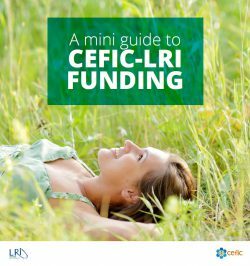 Download here the full version of the RfP LRI-C5.